There were lots of reports about celebrities endorsing research, early brain scans, early blood tests for autism, various ‘genetic tests’ for autism, the flu during pregnancy influencing autism, environmental risks, some promising treatments, some treatments shown to be ineffective, associations with overweight and older moms, older dads, and the usual ups and downs of hopeful stories. 10. The Medical Academy of Pediatric Special Needs provided the first scientific meetings in order to elevate and legitimize the speciality of treating children with developmental challenges. 9. More states mandated appropriate insurance coverage for autism, including Ohio, Alaska, Michigan, Alabama and Washington. 8. The new DSM V criteria were approved. There continues to be a great debate over whether more or less individuals will receive services. 7. iPads, etc. apps took a major place assisting ASD patients. Although some controversy exists, it appears that they are more helpful than not. It is best when the device is used to help communication, rather than as a babysitter or ‘stim’-machine, where the patient watches the same video (or piece of one) over and over. 6. The advocacy organization Autism Speaks ranked Paul Shattuck’s study as one of the top 10 research advancements this year. “Postsecondary Education and Employment Among Youth With an Autism Spectrum Disorder” was published in June in the journal Pediatrics. “Higher income and higher functional ability were associated with higher adjusted odds of participation in postsecondary employment and education.” Who am I to argue with the experts? 5. ABA gained even more standing as a key treatment for autism, and was recognized with a TIME magazine award. “Children diagnosed with autism spectrum disorders… showed changes in the way their brains process human faces and objects… It’s a hopeful sign that it’s possible to halt some of the brain changes linked to autism and possibly even reverse them.” In my experience, combining therapy with biomedical intervention is even more successful. 4. Dr. Martha Herbert published THE AUTISM REVOLUTION: Whole Body Strategies For Making Life All It Can Be. Dr. H is a great scientist and caring individual who has changed the paradigm of ASD, bringing reason and scientific thought about the disorder into the 21st century. 3. Are there really more ASD affected individuals or are we just recognizing it / diagnosing it more often? 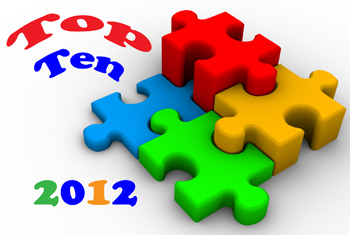 The CDC reported that the number of children with autism had increased to 1/88. The government weighed in on this one, and people started listening. Even the AAP admitted that autism is an epidemic. 2. Reports of an Asperger tendency in the Connecticut shooter. Thank goodness that the media actually acted responsibly, focusing on the tragedy of the victims. Sanjay Gupta did a great job of explaining the distinction between a medical disorder and psychiatric illness. Although that difference won’t be appreciated by everyone, clarity was restored. 1. And, the most important story of 2012… is the improvement and progress that your child experienced, however obvious or perceptible. Let’s get to the causes and effective treatments and in 2013 make even greater strides in this modern epidemic. This entry was posted on Friday, December 28th, 2012 at 9:23 am	and is filed under >ALL<, Alternative and Complementary Medicine for ASD, Asperger's Syndrome, Chelation, Conferences, Holidays & Vacations, News-Maybe-Worthy, Reversing autism. You can follow any responses to this entry through the RSS 2.0 feed. You can leave a response, or trackback from your own site.